As you can see we are celebrating a birthday today. 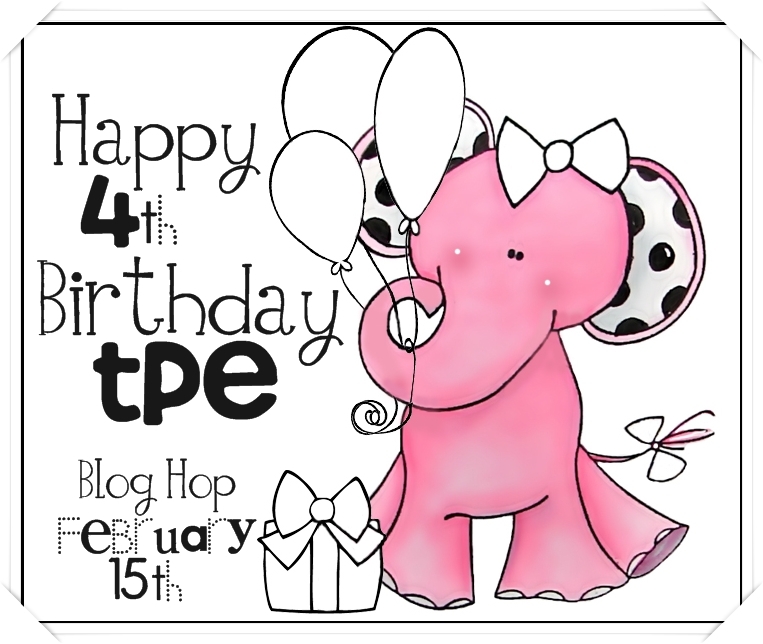 The Pink Elephant is four years old! 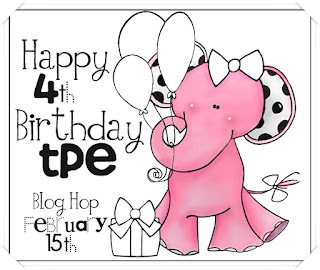 So to celebrate we are having a blog hop and you will love hopping from blog to blog today! 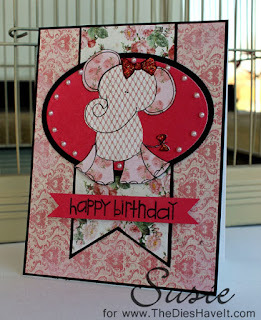 Usually when you see a post from me about The Pink Elephant I am showing you a challenge and a digital layout, but for the blog hop today, I opted for a birthday card instead. I printed and cut my Ella Elephant image using my Silhouette Cameo. All of my background papers are from Authentique and the sentiment is from the Paper Smooches Sentiment Sampler. I hope you like my little birthday greeting! Now for the details on the hop.....leave a comment on each blog by Sunday, February 17 at midnight and you could win one of the prizes that are listed on The Pink Elephant blog. The winners will be posted there on Tuesday, February 19th. 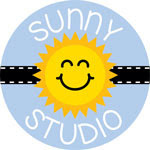 You probably arrived here from Sherry's wonderful blog and now it's time to see what Melissa Craig has for you. Just click on her name to be transported! 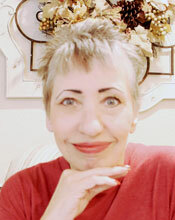 Have a wonderful time hopping and I'll see you right back here tomorrow. Sussie, this is adorable! Love that layout! Very nice. I love the little pearls and the paper. a paper-pieced Ella is perfect to show off her versatility! love this, Susie! Adorable card, Susie! Love the paper piecing on sweet Ella...great idea! Fabulous job! What a simply adorable card Susie! What a brilliant idea paper piecing her in different dps! Love it! Susie, this is an adorable card and just love the papers you used here. I ♥ this! Love the colors you used and Ella looks fantastic paper pieced! Your card is totally adorable. I love how the black makes the colors pop! Wonderful job! Beautiful card! Ella's all decked out for a big celebration! Great colors and piecing. Absolutely Gorgeous! Beautiful paper piecing and I love the layers and papers! Awesome! Such a fun card, love the papers you chose! Like the floral motif & embellishing pearls. Such a darling card!Love the pattern paper!SWEET! such adorable card! love it!! I learned something new! I might have to get the digi of Ella so I can cut her out with my cameo! Wow, I did not know you could do that! Thanks for sharing! Awesome Card! Fabulous card....the paper-piecing is awesome and I love how Ella looks in that 'cute outfit'. Hope she and all the TPE folks have a wonderful birthday!! Thanks for sharing!! Love your creativity!! 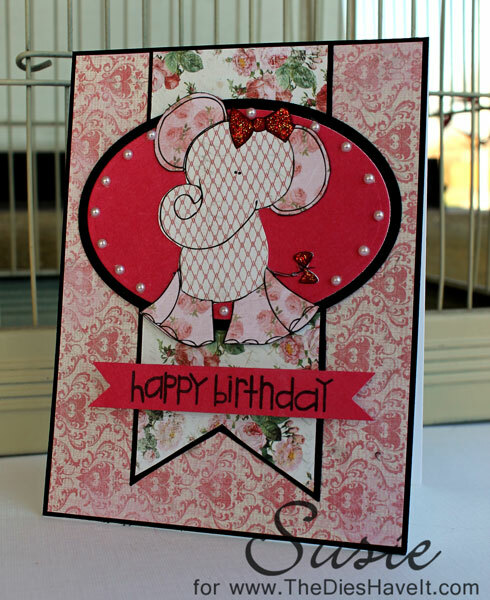 Such a beautiful card.. Love paper-pieced cute elephant, it is looking so cute..
What a fun card- love all the papers you used to make the sweet Ella come to life! Wow~ this card is fantastic! 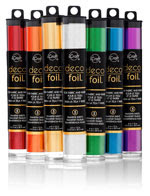 totally darling colors on your card!!! 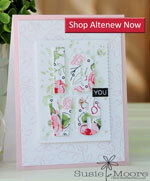 Oh wow Susie such a lovely card just love seeing all the different ways you gals have used Ella. Very cute and I love the paper piecing! WOW!! Ella looks fantastic!! and what a beautiful layout! TFS! Adorable card with Ella that look so pretty.. love de papers and the wonderful colors. Oh, how cute and girlie! Love the paper piecing. I love your card!!! Great job with the PINK ELEPHANT!!! I love your card design. So cute. 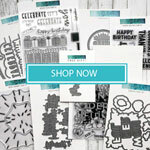 I love all the patterned paper choices you made - especially for Ella. Super cute. Cute card. Like the paper piecing and the color palette that you used on Ella. Your birthday card is just lovely! I love the paper piecing! Gorgeous papers and the black creates good contrast. Soo pretty, thank you for the inspiration. Your card is so lovely. I love the paper pieced elephant. Great! Adorable card Susie! Love the layout and the paper piecing. Awwwww this is super adorable!! I LOVE the LO and the beautiful papers!! The paper piercing is too cute! I love pretty patterns and Ella is adorable donning them. Fantastic card, and I love all your pattern choices! Love the paper piecing and the layout! Wonderfully put together!